DeMar Darnell DeRozan is an American professional basketball player who plays for the San Antonio Spurs of the National Basketball Association (NBA). DeRozan attended Compton High School and played his high school basketball at USC for the Trojans. In the 2008 season, he was named McDonald’s All-American and First Team Parade All-American. In his sophomore year, DeRozan scored 28 times in doubles figures for the Trojans in 35 season games. He was named Pac-10 All-Freshman Team and Pac-10 Tournament MVP. He was drafted as the 9th overall pick in the 2009 NBA Draft by the Toronto Raptors. The 2013-14 season was a breakout year. He averaged career-high 22.7 points, 4.3 rebounds, and 4.0 assists per game. DeRozan also helped the Raptors win an Atlantic Division title for the first time in seven years. In the Playoffs, he averaged 23.9 points, 4.1 rebounds and 3.6 assists per game as the Raptors lost to the Brooklyn Nets in seven games. In the 2016 NBA Playoffs, DeRozan averaged 20.9 points 4.2 rebounds and 2.7 assists and helped the Raptors to reach the Eastern Conference Finals for the first time. In the 2016-17 season, DeRozan scored 30 plus points in 9 of the first 11 games and became just the second person to do so since Michael Jordan did it in 1987-88. He finished the season with career-best averages of 27.3 points, 5.2 rebounds, and 3.9 assists to go along with 1.1 steals per game. His 27.3 average marked the second highest in franchise history after Vince Carter’s 27.6 in 2000–01 season. In 10 playoff games, he averaged 22.4 points, 4.9 rebounds, 3.4 assists and 1.4 steals per game. In the 2017-18 season, DeRozan scored a franchise-record 52 points to help the Raptors to win a 131-127 overtime game against the Milwaukee Bucks. In Game 2 of the 2018 NBA Playoffs, DeRozan matched his playoff-career-high 37 points against the Washington Wizards. In 10 playoffs games, he averaged 22.7 points, 4 assists, and 3.6 rebounds as the Raptors got swept by LeBron James’ Cleveland Cavaliers in the second round. As a member of the Raptors, DeRozan was named as an All-Star four times and an All-NBA member two times. 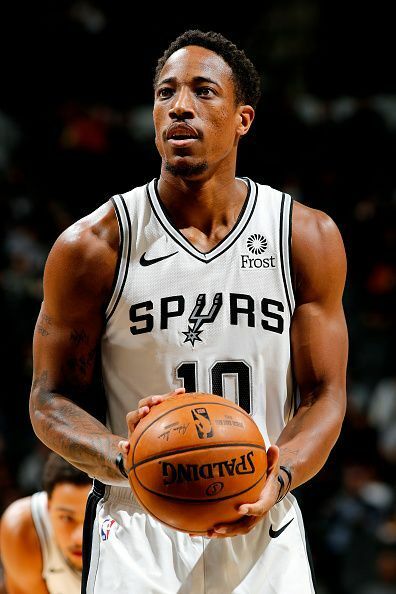 In 2018, DeRozan, along with Jakob Pöltl and a protected 2019 first round draft pick, was traded to the San Antonio Spurs in exchange for Kawhi Leonard and Danny Green.